Noted for its simplicity and elegance, Amish country furniture holds a distinctive place in the world of Amish furniture. Similarily with the Shaker and Mission styles as a classic design. In previous posts, we’ve explored country furniture’s connection to cottage and wicker furniture styles. So in today’s post, we’ll examine the classically-designed Biscuit Safe Hutch in Home in the Heartland: Amish Country Furniture. A rich finish marks the classic Biscuit Safe Hutch. 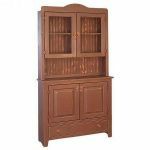 The Biscuit Safe Hutch boasts a sand-thru paint finish with 20-coat varnishing and antique distressing. Along with Eastern White Pine wood construction, wood knob hardware, wood slat backing and a variety of custom options. Therefor the traditional style and wood paneling make Amish country furniture a notable style, one that has remained popular for decades. To view a wide variety of country furniture, visit Brandenberry Amish Furniture. Or visit us in Shipshewana, Indiana, and see first-hand why Amish-crafted country furniture is a style for the ages.